was an English mathematician, logician, and cryptographer. Alan Turing was based at Bletchley Park , Bletchley in Buckinghamshire, while acting as the leading cryptanalyst of German ciphers during the World War II. He was the central force in continuing to break the Enigma machine     , and to crack the Lorenz cipher (codenamed "Tunny") . Alan Turing was one of the pioneers of the information theory and computer science. He was highly influential in its development, giving a formalization of the concepts of "algorithm" and "computation" with the Turing machine, which can be considered a model of a general purpose computer . 4.1 Could one make a machine? Turing machines are abstract symbol-manipulating devices which can be adapted to simulate the logic of any computer algorithm, described in 1936 by Alan Turing  , as thought experiment about the limits of mechanical computation. An example of a concrete Turing machine is the Busy beaver  . The Universal Turing machine can simulate an arbitrary Turing machine on arbitrary input, and can be considered as the origin of the John von Neumann architecture. A universal Turing machine can calculate any recursive function, decide any recursive language, and accept any recursively enumerable language. According to the Church-Turing thesis, the problems solvable by a universal Turing machine are exactly those problems solvable by an algorithm or an effective method of computation, for any reasonable definition of those terms. For these reasons a system that can simulate a universal Turing machine is called Turing complete. Turing addressed the problem of artificial intelligence, and proposed an experiment now known as the Turing test, an attempt to define a standard for a machine to be called "intelligent"   . Alan Turing used chess-playing as an example of what a computer could do. Along with David Champernowne he specified a chess playing algorithm, implemented as "paper machine" dubbed Turochamp. Since there was no machine yet that could execute the instructions, he did himself, acting as a human CPU requiring more than half an hour per move. One game is recorded, which Turing's "paper machine" lost to one of his colleagues , Alick Glennie. At the University of Manchester, Turing began programming Turochamp, as well as Michie's and Wylie's program Machiavelli, to run on a Ferranti Mark 1 computer, but could not complete them . Could one make a machine? In his 1953 paper 'Chess' in Bowden's Faster Than Thought  , Turing asks some questions, answered and discussed them, mentioning evaluation features, the concepts of minimax strategy, variable look-ahead, quiescence and learning. He does not explicitly mention the name Turochamp, but the 'Machine', and its game versus a human   . Could one make a machine which would obey the rules of chess, i.e. one which would play random legal moves, or which could tell one whether a given move is a legal one? Could one make a machine which would solve chess problems, e.g. tell one whether, in a given position, white has a forced mate in three? Could one make a machine which would play a reasonable good game of chess, i.e. which, confronted with an ordinary (that i, not particularly unusual) chess position, would after two or three minutes of calculation, indicate a passably good legal move? Could one make a machine to play chess, and to improve its play, game by game, profiting from its experience? To these we may add two further questions, unconnected with chess, which are likely to be on the tip of the reader's tongue. Could one make a machine which would answer questions put to it, in such a way that it would not be possible to distinguish its answers from those of a man? Could one make a machine which would have feelings like you and I do? Alan Turing talked at Bletchley Park with his younger colleague Jack Good about what we would now call chess-playing programs. They got the idea of searching decision trees for the best move. Turing knew the game of Go as early as 1936: in fact he explained it to Christopher Morcom's mother shortly before he left for America. At Bletchley Park he showed the game to others including Jack Good. According to the British Go Association's page it was Good who twenty years later popularised the game in Britain. In the later years of the war, he talked with a young student, Donald Michie, about the prospect of machines 'learning.' In other conversations he talked about 'building a brain.' It seems that it was during the war that he came to the view that anything done by the brain must be a computable operation, and so could be simulated by a Turing machine. Turing's post-war ideas reflected the discussions he had enjoyed during the wartime period. After 1945 he often used chess-playing as an example of what a computer could do, and in his 1946 report on the possibilities of a computer, made his first reference to machine 'intelligence' in connection with chess-playing. 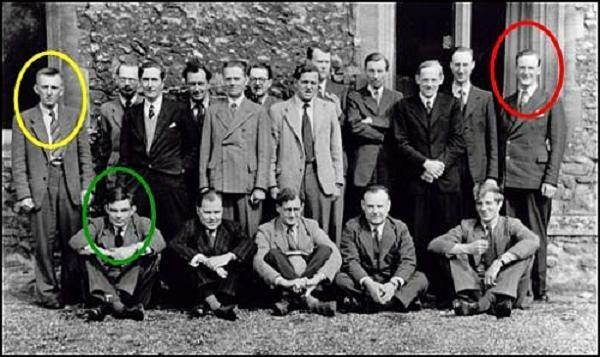 In 1948 he met Donald Michie again and competed with him in writing a simple chess-playing algorithm. Turing was just 41 years old when he committed suicide, two years after undergoing a court-ordered chemical castration. He had been found guilty of gross indecency for having a homosexual relationship. The punishment in 1952 was either a prison sentence or chemical castration. Turing chose the latter. In September 2009 the British government has issued a formal apology for the way Alan Turning was treated   . featuring Marvin Minsky, Andrew Hodges, Norman Routledge , Jack Good, Shaun Wylie, Joan Clarke, Robin Gandy et al. ↑ Alan Turing (1936). On computable numbers, with an application to the Entscheidungsproblem.